But recent developments in Guangdong province suggest that there may be another, deeper contradiction: that between Xi’s increasingly dictatorial rule and his desire to better the lives of poor people. Beginning in May, a group of workers from Shenzhen Jasic Technology Co., Ltd (Jasic) responded to the company’s various efforts to cheat them out of their due compensation by establishing an enterprise-level trade union, a right guaranteed to them by Chinese law. But rather than finding support from above, workers and their allies have encountered official scorn, retaliatory firings, violent repression, police detention, and spurious legal charges. The Chinese government has long been suspicious of independent worker activism, a fear that has intensified in the past several years. The government-linked All-China Federation of Trade Unions (ACFTU) and its affiliates are the only unions authorized by the Chinese state, with independent trade unions long suppressed. Following a severe crackdown in December 2015, independent labor NGOs have been badly hamstrung, leaving workers with no organizational resources. The Jasic workers’ efforts to go through the official system were motivated by a litany of grievances with management, including underpaying workers’ housing funds and an arbitrary system of fines. These workers complained to the district-level trade union federation, which initially responded that the workers could organize an enterprise-level unit to help address their concerns. Following the advice of the union federation, the workers decided to establish a workplace union and were able to collect signatures from eighty-nine workers to support this endeavor. However, instead of assisting and guiding the workers to form a union, a duty specified by the Trade Union Law, in July the union federation did an about-face and claimed that the workers’ effort was illegal. Jasic also denounced the unionization efforts and fired six worker activists in retaliation. 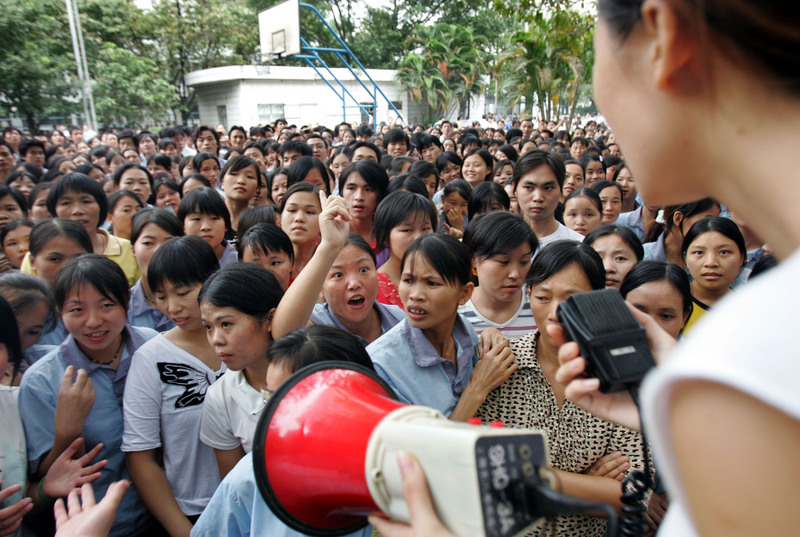 As the case received greater national attention, the campaign gained support from workers in other nearby factories and university students from all over the country. Undeterred by the official hostility, the Jasic workers continued protesting against the factory and demanding to form a union. Instead of responding to their legitimate requests, on July 27 the government arrested twenty-nine activists including Jasic workers, supporting workers from other factories, and students, and accused them of “picking quarrels and making trouble,” a criminal charge often used by the government to suppress protests. Although this was a completely worker-initiated movement, some NGOs were caught up in the crackdown. A staffer and the legal representative of Dagongzhe, a Shenzhen-based labor NGO, were arrested and detained by the police on the same charge. Without any evidence, the state-controlled Xinhua news later scapegoated Dagongzhe and Hong Kong–based labor NGO Worker Empowerment as responsible for the Jasic workers’ collective actions. Eventually, on August 24 the government deployed riot police to crack down on the workers and their supporters, arresting more than fifty. Some of them were released, but as of September 4, four Jasic workers were officially charged; another eleven supporting workers and students were either under surveillance, imprisoned, or had disappeared. To be sure, Jasic workers are not the first who have sought to form workplace unions in accordance with the law only to face government and employer retaliation. Based on our previous research in China, since 2010 workers from numerous factories in Guangdong province have solicited the help of upper-level union federations when trying to establish workplace units. However, the upper-level unions have generally sided with the companies and have been unsupportive of workers. Only upon workers’ incessant urging have some district-level unions supported workers’ request to form unions. Worker complaints about management interference in unionization have generally been met by indifference or hostility from the upper-level unions. As with the Jasic case, many companies have had a free hand to take retaliatory actions against workers endeavoring to unionize, such as assigning them less desirable job duties, suspending their duties, and demoting their positions. This inability of the system to allow workers to secure their legal rights to a union is particularly problematic given the country’s innumerable labor disputes. The Chinese government seems to be aware union reform could help stabilize labor relations. To make the ACFTU and its affiliates more responsive to workers’ grievances, during the 2000s the government pushed for workplace unionization, especially in foreign-owned Fortune 500 companies, through a top-down effort. Following a major strike wave in 2010, the government tried to strengthen enterprise-level union organizations, along with implementing pilot workplace union elections and collective bargaining. The Jasic workers’ attempt to set up a union simply reflected what the government itself has been advocating. If workers take the initiative to improve their well-being in ways consistent with the law, there is no reason to suppress them and officials should be actively working to enforce a lawful work environment. But in the increasingly repressive political environment ushered in by Xi’s tenure, any worker-led efforts are seen as potentially destabilizing. If we take Xi at his word, then it would seem that ensuring decent wages and benefits are an important aspect of addressing the “unbalanced development” that so worries him. Without some form of organization within the workplace, however, employers will likely feel empowered to continue to cheat workers out of their wages and benefits, calling into question their pursuit for a better life. As is recognized by Chinese law, workers will need some organizational capacity to pursue their own interests — not even the mightiest dictator can reach into every workplace in a country of 1.4 billion.